Grades do not tell anything precise about the student’s abilities in the areas of scientific work, project management, critical thinking and social skills. And, in Switzerland especially, they do not offer any meaning to non-Swiss. Additionally to the grade, we offer a report that describes the student’s abilities thoroughly. 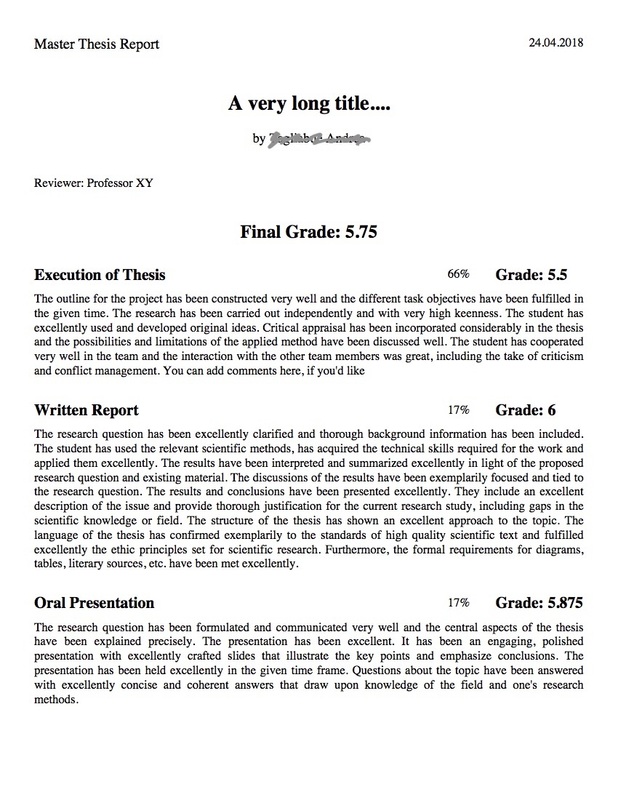 Since report writing is arduous, we developed a web tool MTE (Master Thesis Evaluation) that will calculate the grade and produce a report in a few clicks. You can still individualize the report afterwards, deleting and adding parts. 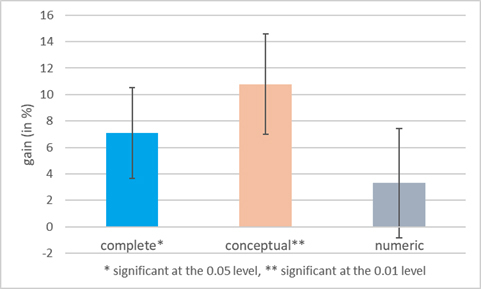 Compliance: Grade calculation and partition follow the study guidelines. Fairness: The professors all assess along the same criteria. Service to the student’s future: The report can be part of the student’s portfolio. More info on MTE can be found in the moodle course “Master Thesis Evaluation“. Meine Kommentare zum Artikel “Analoges schlägt Digitales – schöne alte Lesewelt” (Maik Philipp) könnt ihr auf folgender Website lesen. Kommentiert doch meine Kommentare! Mehr zum Thema: Ein älterer Artikel über ‘Handschrift vs Tippen‘ habe ich vor nicht ganz vier Jahren hier geteilt. Further reading: Forbes, Lernen mit Virtual Reality. The main goal of interactive lecture material is to engage students, which promises better learning outcomes. As a byproduct, it makes lecturers happier and have fun! 🙂 The following selection of scenarios have been used at least a few times each. Bear in mind, there are many more possibilities. Students are the best judges of your material. Make it available for annotation and let students correct it and give you feedback. Already after one round, your material will be perfect! 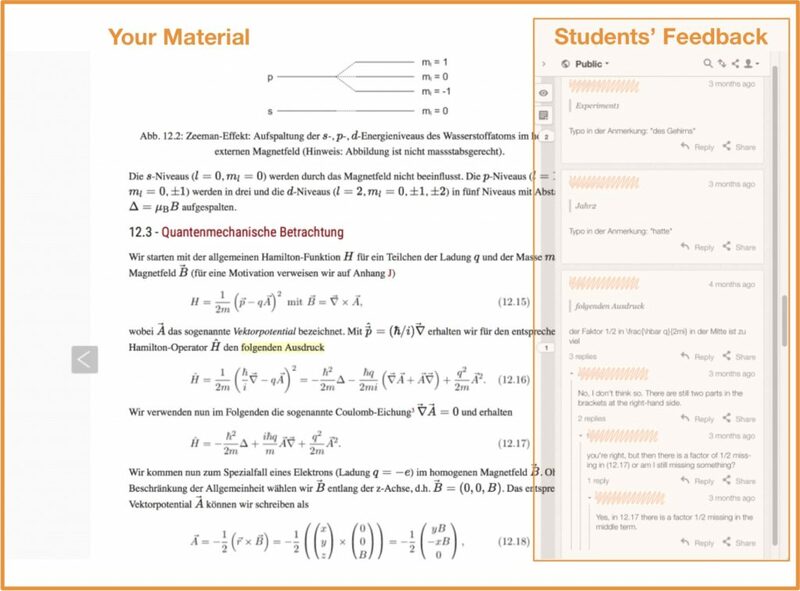 Many students or many groups of students create material together. Students experience collaboration and see its benefits. They have access to other students’ work and because the material is presented as a whole, the result is something they can be proud of. Furthermore, peer review and annotation by peers or assistants is then possible. When students publish work (text, papers, exercise solutions, etc. ), assistants and lecturers can easily give feedback and start discussions on very good points students came up with or problems they seem to have, on the spot. Students can answer predefined questions (by lecturers/assistants/peers), ask questions about difficult passages, paraphrase, discuss interesting points, attach complementary material, prove points with links to other research, reflect and form opinions right where it is relevant. This kind of assignments foster critical thinking and collaboration. It is much easier and more appealing than using a forum, which is the alternative for such tasks. Easily get feedback (students can append a star to parts of content of your choosing) on good/important/… content. 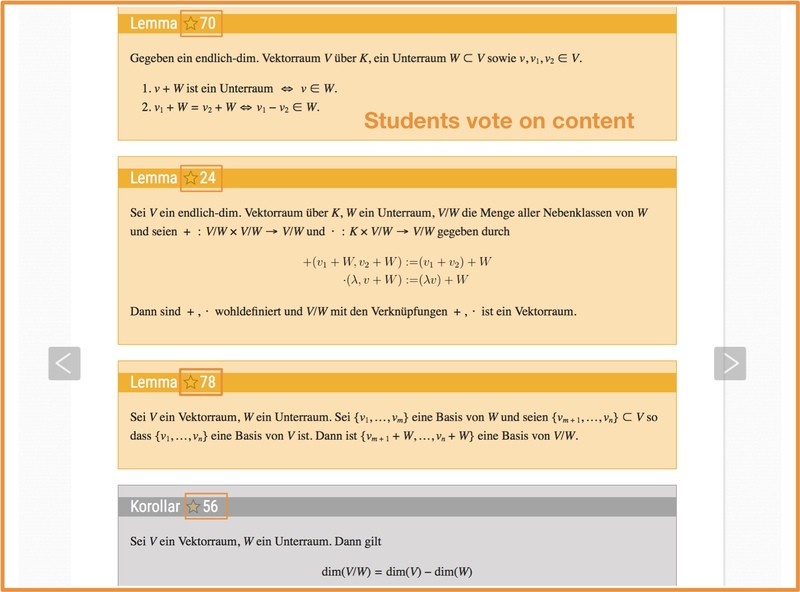 You can even go further and let students collaboratively decide through their voting on…[depending on your scenario]. By far my favorite application in eSkript are the interactive modules. The possibilities are endless. You can enhance your material with interactive videos, drag and drops, timelines, interactive images (juxtapositions, sliders, info hotspots, hidden hotspots, and sequences), and many more. A scenario that has worked repeatedly well is the design of interactive modules by students. Check out a few examples of interactive modules! These and more scenarios in more details with detailed tasks, profit, caveat and real life cases can be found in the eSkript Scenarios. Have fun and find new ways to engage and interact with your students! Open your first eSkript today. Teaching anyone properly about Climate Change is a difficult task. The concept is simple to grasp: “if the global temperature rises above 2°C in 2100 – that’s bad!” But understanding the sophisticated climate models that scientists develop and translating this understanding into political negotiations, that’s a tough challenge. The World Climate Simulation, made available by the MIT think tank spin-off Climate Interactive, and facilitated by Prof. Dr. Florian Kapmeier (ESB Business School, Reutlingen University) for MTEC faculty and students on March 19th 2018, did just that. Here are some personal reflections. The scenario is as follows: at the next United Nations Climate Change Conference, the UN Secretary General (enacted by the simulation’s facilitator) asks the participating countries and country blocs to make pledges to curb the negative effects of climate change. USA and Europe get seats at lushly decorated conference tables, stocked with privileges and amenities: coffee machines, food, fruits, and soft drinks. Other developed countries like Russia, Canada etc. find themselves at sparsely equipped conference furniture, but they still get a few sandwiches. China and India both get nothing but some water on their tables, while the large bloc of developing countries face a blunt reality: no food, no water, no chairs, no table. The unequal distribution of wealth across the nations becomes clearly visible at the beginning of the game. At the sidelines and without voting powers, fossil fuel lobbyists, climate activists, and a delegation of US cities and states, the US Climate Alliance, complete the line-up. The simulation can easily accommodate 60 participants; we played it with 20 and without the fossil fuel activists. Equipped with brief profile information for the participants that summarize their respective positions in the climate negotiations, a first round of negotiations starts. The countries give a two-minute statement in the UN assembly. Their pledge contains concrete numbers: the year their emissions peaks, the year the reduction of emissions begins, the rate of yearly reduction, and percentage numbers for the prevention of deforestation and afforestation efforts. And then, money talks: how much will the regions contribute to the global fund for mitigation and adaptation to climate change in billions USD per year? These variables from all six countries and country blocs are put on a flipchart. The US delegation opted for realpolitik in the spirit of pulling out of the Paris climate agreement. Climate change is fake news, hence: no contributions. The EU delegation pledged their green agenda, but tied their contributions to the fund with deal breakers: China, India, and the developing nations have to aim for ambitious goals to curb climate change. Which they didn’t. China argued that the causes for the current situation are rooted in the American and European centuries of industrialization; therefore, it is a European and American responsibility to fix the mess. Likewise, India’s delegation saw prospects of their nation’s industrial development. The developing nations sought to catch up economically and would need to produce enough food for their population. Actually seeing the abundance of food in the “first world” and growing increasingly hungry (having skipped lunch) did not lead to appeasement. The Climate Alliance’s meagre donation of grapes rather accentuated their grievances. A political solution to the climate change negotiations seemed far away. Having given their pledges, participants voted on the expected result for global warming in 2100. Would it be business as usual with its foreseeable catastrophic events of more than 4°C rise in global temperatures? 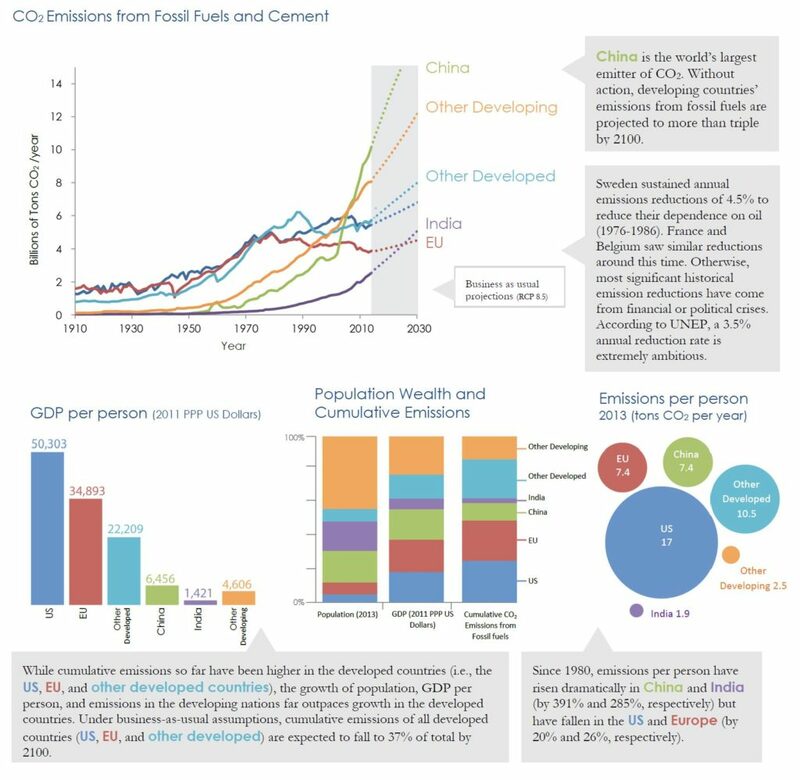 Or would the pledges lead to outcomes around 3.6°C or even approach the ambitious aim of 2°C global warming in 2100? Pessimism flooded the room as the numbers were punched into C-ROADS. 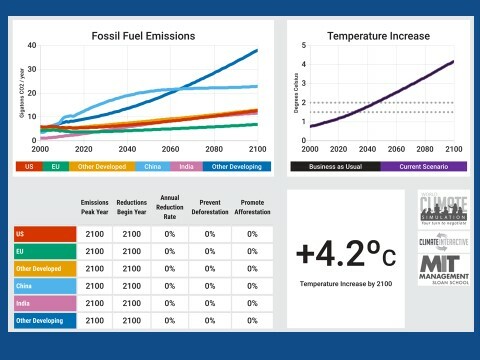 C-ROADS (Climate Rapid Overview and Decision Support) is a scientifically-reviewed policy simulator on climate change, with which users can test their own emission pathways to limit global warming to below 2°C and thus learn for themselves. The results are calculated in real-time and give a direct visual output on the effects on global warming (temperature), ocean acidification, and sea-level-rise. A screenshot is given in figure 2. Result of the first round of negotiations: somewhere around 3.6°C rise in temperature. The UN Secretary General took the outcome to give a passionate input to the conference participants of what this would mean in reality: flooded coastal regions all over the world, with an uninhabitable Shanghai, and foreseeable catastrophic weather conditions with ever stronger and more frequent tropic storms. The second round of negotiations began with Trump walking out and going golfing. India claimed USA’s coffee machine, and the developing nations began looting. They stripped the US delegation of their sandwiches, cookies, and soft drinks, and also took the conference chairs. They left the flowers. The EU, Russia and Canada negotiated as if there is no tomorrow, and China’s delegation opened up to the idea that actually having a tomorrow that is worth waking up to was not too bad after all. The second round of pledges was typed into C-ROADS, and while the result improved upon the first round, it was still far away from the 2°C goal. A sobering outcome. The ensuing discussion lead to a much deeper understanding of the different factors and their effects on the climate change projections. It is difficult to describe the increased comprehension of the participants for the numbers and the data in the complex climate models. 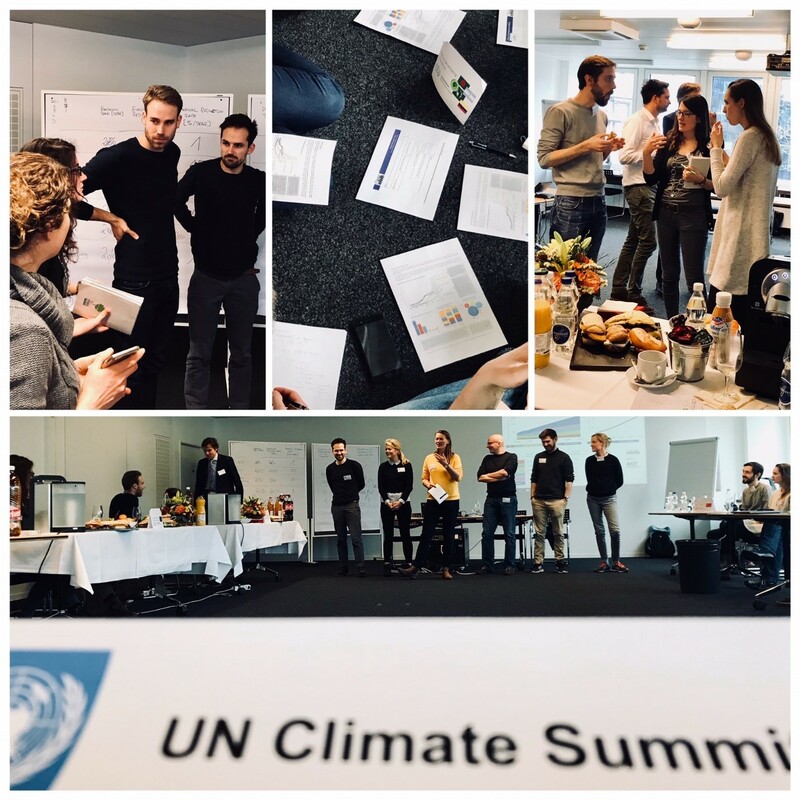 But the questions and attempts to solve the climate dilemma made it clear that the World Climate Simulation succeeds in engaging participants with a truly mindboggling dataset. It accentuates the interdependencies of the different countries and the need to collaborate to reach solutions. In a more striking way, the potential health benefits for people that will accompany a transition away from fossil fuels to renewable energy sources surprised me. To pick just one example: less fossil fuel use means less asthma; treating asthma is expensive, not having to treat it saves money. In a bigger context, and maybe touching the game’s underlying metanarrative, if we simply stop poisoning ourselves with CO2 emissions, we could be ready for big strides into the right direction. But we have to act immediately. From a didactic point of view, the simulation combines learning about a complex dataset and its interrelated factors with an emotional dimension. Participants play a role, and receive immediate feedback about their negotiation results via the C-ROADS tool. Intense discussions within the countries and country blocs begin to merge with attempts to collaborate across parties. Concepts about climate change, including false concepts, are addressed in a constructive way that allow participants to model and adapt their decision-making to what they learn. It’s a powerful learning and teaching format. If you want to play the WCS, I believe that the simulation needs a good facilitator to regulate the game dynamics and deliver the Secretary General’s content-heavy input. The teaching notes are very well prepared (see figure 3 for example) and should make it possible for anyone to organize the WCS for the first time. The simulation (in the setting that we played) requires a time slot for about 3.5h-4h. It then gives enough time for a debriefing to summarize the learning experience and let participants reflect on their next steps individually. We had faculty from all levels (Prof, Postdoc, PhD) and master students learning together as participants in the simulation, which added a new opportunity to meet in the department. It was a great learning opportunity! The event was organized by Johannes Meuer (SusTec) and Erik Jentges (MTEC Teaching Innovations Lab). A huge “thank you!” to Florian Kapmeier for an energetic and passionate facilitation of the simulation. Seit mehreren Jahren wird «Flipped Classroom» als didaktische Methode mit hohem Lerngewinn angepriesen. Im «Flipped Classroom» sind die Studierenden angehalten, sich die Inhalte vor der Veranstaltung selbst anzueignen. In der Präsenzveranstaltung werden dann hauptsächlich nur noch Aktivitäten in Kleingruppen durchgeführt, welche als Ziel haben, die zuvor gelernten Inhalte anzuwenden und zu verfestigen. 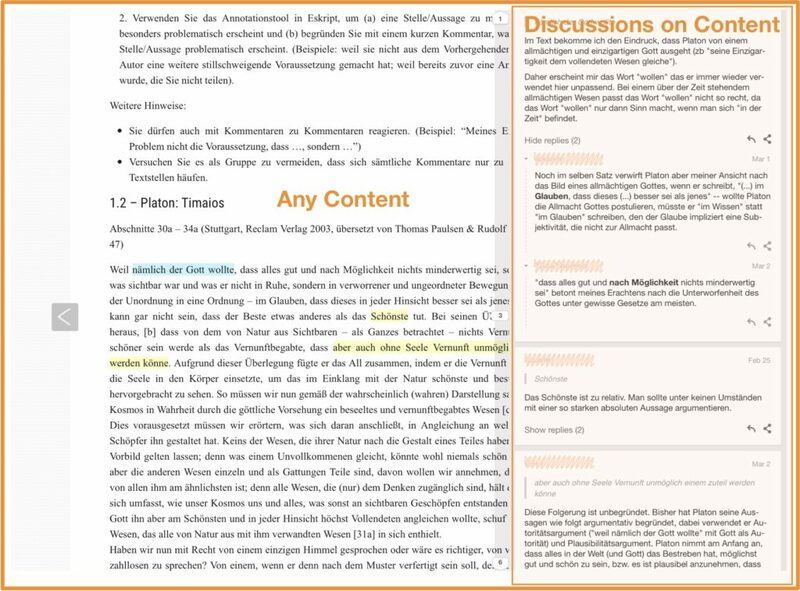 Am Departement Physik hatten wir die Gelegenheit, während eines Semesters eine Physikeinführungsveranstaltung (für Nichtphysiker) parallel als Vorlesung und als «Flipped Classroom» durchzuführen. Prof. Gerald Feldman ist ein Pionier und ausgewiesener Experte im Unterrichten von «Flipped Classroom», in der Physik auch als SCALE-UP bekannt. Während seiner Gastprofessur am Departement Physik bot Jerry Feldman 52 Studierenden einen vorbildlichen «Flipped Classroom» an. Die restlichen 318 Studierenden besuchten die normale Vorlesung. Wir haben beide Gruppen eng begleitet und im Verlauf des Semesters Daten zu ihrem Lernverhalten und zu ihren Leistungen gesammelt. In dieser ersten Runde vergleichen wir den unmittelbaren Leistungszuwachs beider Gruppen während der Unterrichtperiode. In einer zweiten Runde wird das Lernverhalten gegenüberstellt und eine Abschlussrunde soll Auskunft über die Langzeitleistung ergeben. Zum Schluss wird das gesamte Duell dann kritisch analysiert. Nun aber zu den Ergebnissen der ersten Runde. Gemessen wurde die Leistung anhand von drei Messreihen, einem Pretest, einem Posttest und einer Zwischenprüfung. Zu Beginn der Veranstaltung, im Februar, absolvierten Studierende aus beiden Gruppen einen standardisierten Test zum konzeptionellen Verständnis von Kräften in der Mechanik (FCI). Der gleiche Test wurde ihnen dann am Ende des Semesters im Mai nochmals angeboten. 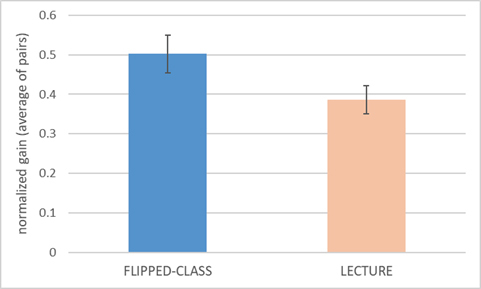 Mit dem Vergleich der Ergebnisse aus Pretest und Posttest lässt sich der Lernzugewinn für die Vorlesungsgruppe und die «Flipped Classroom» Gruppe messen und gegenüberstellen. Studierende des «Flipped Classroom» wiesen dabei einen höheren Lernzugewinn auf als die Studierenden in der Vorlesung. Der Unterschied liegt im Grössenbereich von etwa 11%. Die Zwischenprüfung erfolgte in der 10. Semesterwoche und bestand aus 3 konzeptuellen Verständnisfragen sowie 3 numerischen Problemfragen. Auch hier konnten wir die Ergebnisse beider Gruppen vergleichen. Im Gesamtergebnis der Zwischenprüfung schnitt die «Flipped Classroom» Gruppe um etwa 7% besser ab als die Vorlesungsgruppe. Bei den Konzeptfragen liegt der Zugewinn bei etwa 11%, was mit dem Ergebnis aus Pre- und Posttest übereinstimmt. Bei den numerischen Fragen konnte kein signifikanter Unterschied ermittelt werden, beide Gruppen erbrachten hier vergleichbare Leistungen. 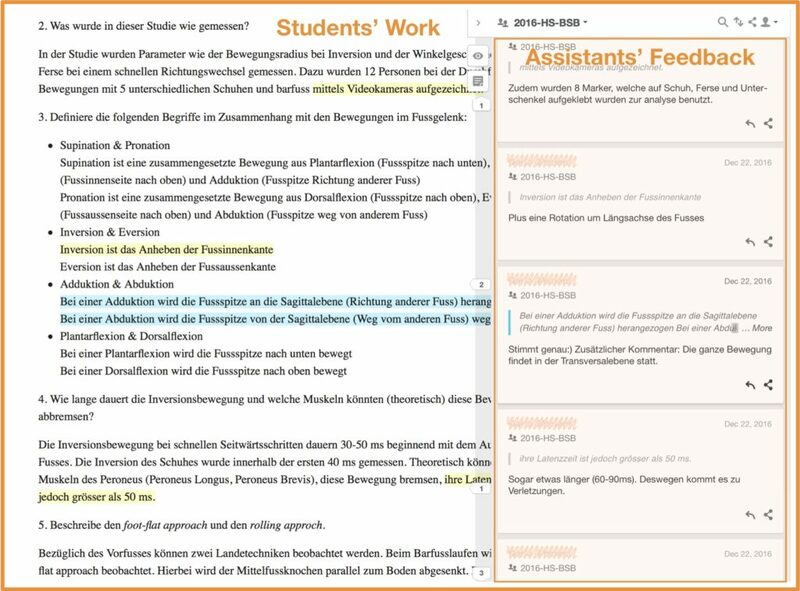 Zusammenfassend schnitt die «Flipped Classroom» Gruppe beim konzeptuellen Verständnis besser ab als die Vorlesungsgruppe. Beim numerischen Problemlösen liegen beide Gruppen gleichauf. Damit verbucht «Flipped Classroom» in der ersten Runde einen knappen Sieg. Hintergründe und Details zur Untersuchung sind >hier< zu finden. In den kommenden Monaten werden wir die Daten zum Lernverhalten in beiden Gruppen untersuchen und diese dann als zweite Runde hier vorstellen. Das Duell bleibt daher noch spannend! Our First Virtual Laboratory: A success story! Imagine a computer game where you click to get through. This is similar but better. The students follow instructions, manipulate samples, use machines, gather information and answer questions along the way to check their progress and understanding. A theory section with all relevant background material is available at all times. The setting looks very much like a real lab, and chemical reactions are shown in 2D or 3D videos. Finally, there is a mission (here: help a sports physician repair athletes’ damaged articular cartilage) that makes the virtual lab’s path and goal clear. In 2015 we, Prof. Dr. M. Zenobi-Wong and her team, started developing the “Tissue Engineering Lab” (TEL) with Labster. The process was easy and rewarding. Since Fall 2016, after two pilot runs, the lab has been used by students every semester. 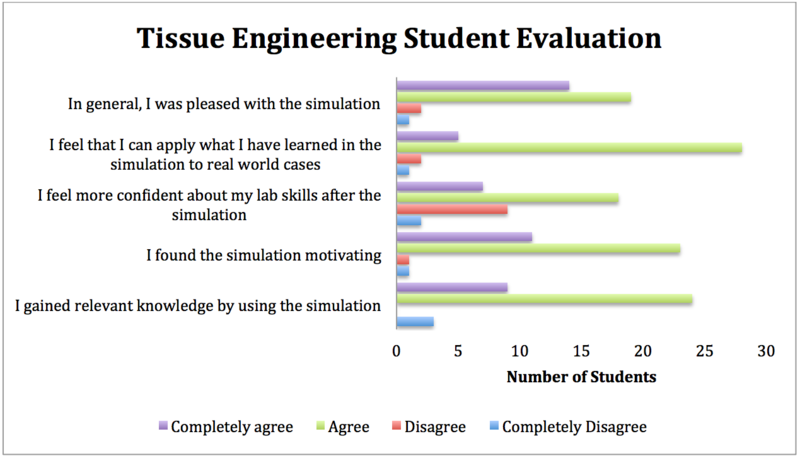 We are very happy about the results as the lab motivated students and they felt that they gained relevant knowledge. Some screenshots, the learning goals and the techniques used can be found on the lab’s main page at Labster. And here is a short (and fast) screencast of the first hydrogel experiment. What are the reasons for using virtual labs? For this lab, it was the first reason, and now students can get lab work done in a one-hour exercise slot in the lecture hall. This is amazing! We are happy to announce that the second virtual lab @ETH Zurich is on its way. In the physical setting, this lab can only be performed by an assistant. To offer the opportunity to students to try it out themselves, Prof. Dr. L. Nyström with Dr. M. Erzinger will develop the “Kjeldahl Lab” starting this summer. 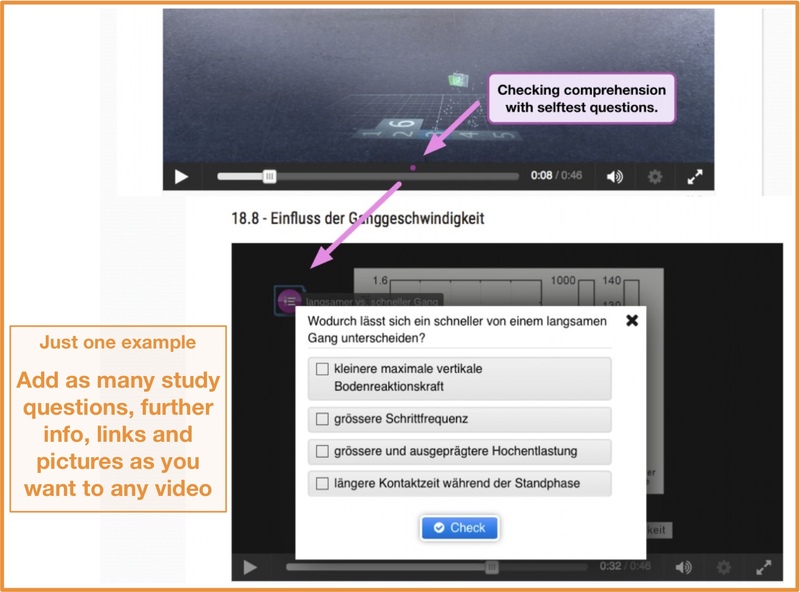 …and how to get students to collaborate using annotations! 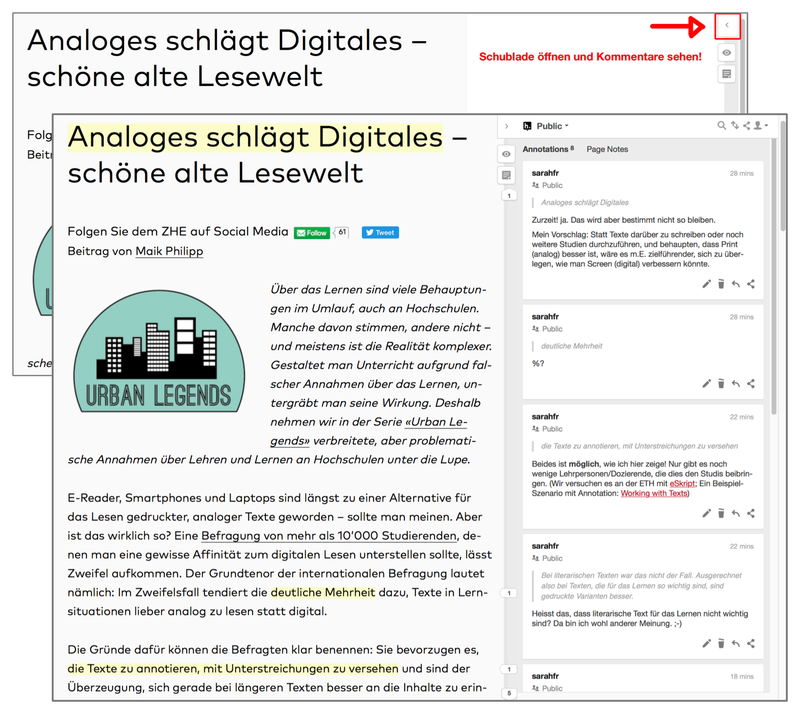 Since fall semester 2015/16 hypothes.is annotation offers the possibility of public, private and goup-private (introduced later) web annotations to the users of eSkript, our platform for Interactive Lecture material. This is a follow up to last year’s blog post “eSkript & hypothes.is – Web annotation for our students“. There you can read some info on web annotation and the story on how I started to get interested in these usage numbers. Web annotation is moving fast, not only at hypothes.is, who has added groups to their functionality and a wonderful dashboard, only to mention two of the many new features, but also, in February 2017, web annotation has become a W3C standard, a web standard! Wow! So what about that new usage data at ETH Zürich? Compared to the first year, every data point has increased. Since 2015, annotations have been made on 279 separate days on 308 eSkript URLs. (Bewegungs- und Sportbiomechanik has 35 URLs.) 145 users were active and 17 groups have been created. (Roughly 1’000 students have been exposed to lecture material on eSkript so far.) 4505 annotations have been made! 318 7.00% are in groups. Group annotations have gained momentum and now reach seven percent of all annotations from almost none. There are fewer public annotations (used to be 10%). 807 17.90% are text annotations. 2 00.05% are page annotations without text. 643 79.70% are original annotations. 52 06.40% are page annotations. 4 00.50% are PDF annotations. The good news here are the 13% of ‘replies’. This is where collaboration begins. Replies (in yellow) were mostly given in August, July and in January, just before the exams, by assistants, I guess. Spring semester 2017 has barely begun, and unfortunately the lectures Solid State Physics and Chemistry of Materials I & II are not held this academic year. Philosophische Betrachtungen zur Physik II with 84 annotations (on just one URL) has also just started mid February 2017 and is doing very well, especially because only 43 students are registered in this course. 43 58.90% are original annotations. 1 01.35% are page annotations. Do you want to know the secret of how to get almost 40% of collaborative annotations? Use a scenario! Have a look at the eSkript scenarios, especially the one on ‘Working with Texts‘. Unsere Studierenden haben im Semesterfeedback sehr positiv auf die Verwendung von Eskript [und hypothes.is] reagiert/geantwortet — sowohl als “Disziplinierung” für sich selbst beim Lesen als auch (und vor allem) als Hilfsmittel, um eine Diskussion von Texten vorzubereiten und Themen zu spezifizieren. Und auch wir [die Dozierenden und Assistierenden] sind von der Qualität und Art der Kommentare positiv überrascht. Translation (Eng): Our students have responded / reacted very positively to the use of eskript [and hypothes.is] in the semesterfeedback – both as a “discipline” for themselves in reading as well as (and above all) as an aid to prepare a discussion of texts and specify topics. And we [the lecturers and assistants] are also positively surprised by the quality and nature of the comments. Next year, Dr. N. Sieroka and the lecture’s staff want to expand the use of hypothes.is annotation on other texts. I want to thank everybody involved and especially congratulate the students who made quite an impression and showed how highly skilled they are! Bravo.